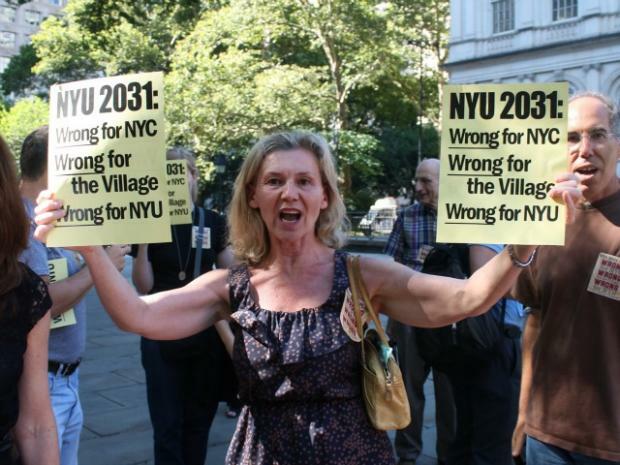 CITY HALL — Nearly 100 opponents of NYU's controversial Greenwich Village expansion plan were tossed out of the City Council's chambers before a final vote Wednesday when they flouted Speaker Christine Quinn's repeated calls for silence. "Shame on you!" the residents shouted, hissing at the councilmembers from the balcony of the chambers and waving yellow signs. After ignoring Quinn's warnings, they were escorted out of the building before the start of the vote. The heated display capped the end of months of emotional public hearings, protests and fervent opposition from residents and faculty at the school. In the end, the council voted 44-1 in favor of a scaled-back version of the 20-year NYU 2031 plan, which paves the way for the development of four new buildings on the two large blocks bordered by LaGuardia Place and Mercer Street, West Houston and West 3rd streets. Brooklyn City Councilman Charles Barron was the lone vote of opposition. While residents maintain the plan will permanently destroy the fabric of the Greenwich Village neighborhood, Quinn said she was convinced the final version balanced NYU's need for more space with the community’s needs. “I think this plan appropriately balances the need of an important university to grow and expand, which is good for our city, with the historic neighborhood it’s in,” Quinn said, assuring that “the historic low-rise nature of the Village will be protected." The plan underwent numerous modifications, including the elimination of a planned hotel, the removal of commercial space from loft blocks and a reduction in the heights of many of the planned buildings. Quinn said the approved version is 26 percent smaller than what NYU had originally asked for, and includes many benefits for the community, including new playground space and seating areas. 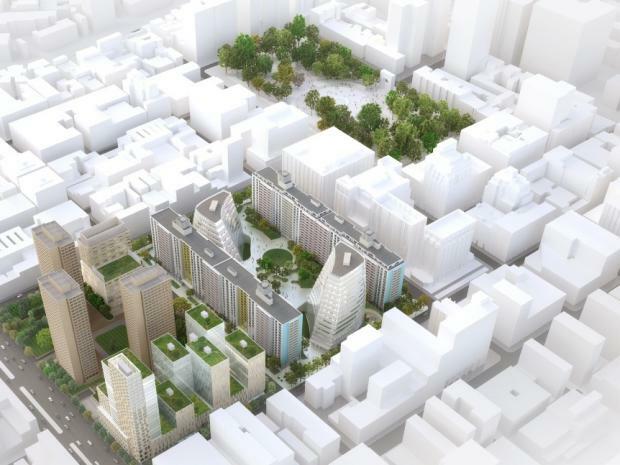 “This is significant and reflects NYU’s willingness to engage in the public process and accept change,” said City Councilwoman Margaret Chin, who helped negotiate the final plan and said she hoped it would forge a new era of cooperation between the neighborhood and the school. But dozens of neighborhood residents and NYU faculty members, who have opposed the plan since it was rejected by the local community board, said councilmembers were dead-wrong. “I think it's outrageous and disappointing that they refused to listen to the voices of thousands of New Yorkers,” said Andrew Berman, executive director of the Greenwich Village Society for Historic Preservation, a staunch opponent of the plan. Patrick Deer, a professor in the English Department, who is one of 400 faculty members opposed to the plan and lives in the neighborhood with his family, called the vote "a really tragic day for the neighborhood." “It’s just heartbreaking,” he said, raising concerns that the expansion will compromise the school's finances and drive up students' tuition. Barron, the council's sole "no" vote, warned the expansion will have a devastating impact on the Village, alienating tourists and changing the character of the neighborhood. Others, like 67-year-old Marianne Edwards, one of the women whose shouting led to the expulsion by Quinn, said that residents had been left out of the process and should have been allowed to voice their frustrations. But Alicia Hurley, vice president for government affairs at NYU, who was among those swept up in the exodus, said the green light was a relief after five years of negotiating and will help the school add up to 2 million square-feet of academic space so it can grow. “This is a terrific day for us," she said as the votes were being cast. "The council really took a hard look and it and made some serious adjustments," she said. "But it was a give-and-take." The school will now begin consulting with designers, who will help shape new classrooms, performance facilities, an athletic center and student and faculty housing. In the meantime, she said, the university intends to begin making promised improvements to public spaces on the blocks, including adding new seating on Bleecker Street, building a new playground on LaGuardia Place and improving public access to the Sasaki Garden at Washington Square Village. Residents said they would continue the fight. Jim Welden, an attorney for the residents, said he was planning to file a lawsuit against the city over its approval process. “This is the height of arbitrariness and capriciousness,” he maintained.